It’s a deal: Marking the adoption of the park in the city are (from front left) Osman, Mohd Sheriff, Ahmad Phesal Talib, and Ahmad Fuad. The country’s oldest bank Standard Chartered Bank Malaysia Berhad (Standard Chartered) recently entered into an agreement with Kuala Lumpur City Hall (DBKL) to adopt a prime location public park in the heart of the city recently. The bank is the first organisation to be offered the opportunity to adopt the 40,000 sq ft (4,000 sqm) park under the government’s Signature Park Adoption Programme as one of Greater KL and Klang Valley’s Greener KL Entry Point Projects (EPPs) under the Economic Transformation Programme (ETP). Greener KL project will further Kuala Lumpur along its goal to become the top 20 most liveable cities in the world by 2020. To commemorate the initiative, a Memorandum of Agreement (MOA) signing ceremony between the two parties was held marking the bank’s sponsorship of the development and management of maintenance of the park for the next seven years. 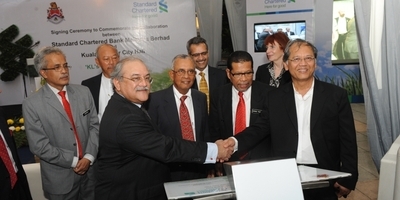 Signing on behalf of Standard Chartered Malaysia was managing director and CEO Osman Morad and representing the city was Ahmad Fuad. The signing was witnessed by Federal Territories and Urban Wellbeing Ministry secretary general Datuk Ahmad Phesal Talib, Pemandu director of NKRA and NKEA Datuk Ahmad Suhaili Idrus, Standard Chartered Malaysia chairman Tan Sri Mohd Sheriff Mohd Kassim, Standard Chartered South-East Asia regional CEO Neeraj Swaroop and Standard Chartered Plc non-executive director Ruth Markland. The park offered to Standard Chartered, is situated in lot 776 and lot 83 at Jalan Pinang and Jalan P.Ramlee. Located amid the highrises and towering buildings, it is the only remaining green lung in and around the Kuala Lumpur city centre. Tree species that are indigenous to Malaysia such as Hopea odorata and Pongonoia will be planted to support the concept of an “urban forest” amid the concrete jungle.